Featuring a 125-foot waterfall and an abandoned mine shaft, Henline Falls is a scenic and worthwhile destination for an easy day hike in the Little North Santiam River area. At less than two miles round trip and with only 200 feet of elevation gain, this is a great hike for families, provided you keep the children away from steep drop offs. The abandoned adit of the Silver King Mine burrows into the cliff on the right side of the falls and is now blocked by a bat gate.During periods of lower water levels Henline Creek will split into two or three more distinct channels of water and spray into the cove in multiple distinct sheets of droplets.This disconnect between the powerful falls seen during the wet season and the lacy, delicate falls encountered in the dry season will determine whether the entire falls can be viewed by visitors - at high water so much spray blasts out from the falls that attempting to cross the creek to where all-encompassing views are possible is treacherous (and photography is pretty much impossible). 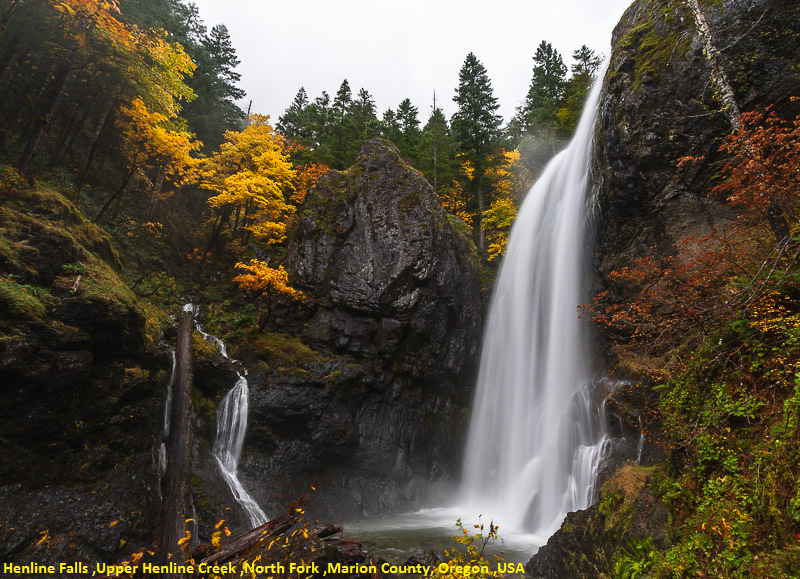 From the junction of Interstate 5 and Highway 22 in Salem, take Highway 22 east for 27 miles, then turn left onto North Fork Road - signed for both Elkhorn Valley and the Little North Santiam Recreation Area. Follow North Fork Road for 17 miles and then bear left on FSR# 2209, signed for Jawbone Flats and the Opal Creek Trail. About 1/5 of a mile up Road 2209 find the parking area for the Henline Falls / Ogle Mountain trailhead on the left. The trail leads along an old road for half of a mile, then branches left where the old road continues right, and continues to the base of the falls in another half mile.